Release Your Power Coaching uses proven techniques (The 8 Strategies) and other motivational and empowering tools to help you achieve your deepest desires for your personal, professional and spiritual life that enable you to live Authentically. Each of The 8 Powerful Strategies, taken from the book Release Your Power, is outlined in its own separate e course and taught via webinar or teleseminar. If you are at the Peak of your Success and just need a tiny push then by all means skip the Coaching Program and just purchase the book and/or workbook and work on your own. But, on the other hand, if you want to get your Success on the cutting edge and take your life to a whole New Level then don't waste a moment wondering if you should work with a Life Coach! You know in your heart that you are just like me, a true go-getter, and when opportunities like this show up in your life you take charge! And so much more. Is this the right time to take the next step to your Total Freedom? YES! The Release Your Power Coaching Program will help you activate your Purpose, Passion & Power so that you can have a fulfilling life, at work, at home and at school. 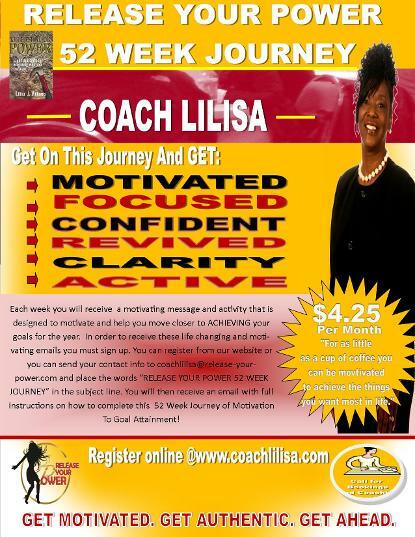 I am excited you have selected me to work with you as your personal coach and instructor. many people just simply don't know how to do that or where to get started. Finally, a simple system that uses universal principles is here to rescue you from a life of missed opportunities, failed attempts at goal setting and achievements, and playing down to your true talents and feelings of fulfillment is here! Once you start and complete this journey of discovery and self mastery you will be able to live the rest of your life fulfilled, successful and powerful! This system will teach you in a step-by-step! Purpose to motivate you up! Happy, successful, empowered and fulfilled. You deserve to live the true prosperous life. This coaching opportunity will give you the edge you are looking for in your personal, professional and spiritual life. Working one-on-one with a coach can add major value to your success and goal attainment. The activities are priceless and the engagement is invigorating! I invite you to come visit my other site and learn more about the power of Release Your Power and how it prepares you for GREATNESS!